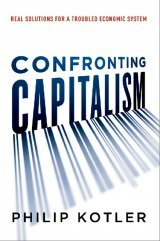 Capitalism is clearly troubled, as Philip Kotler writes so eloquently in "Confronting Capitalism: Real Solutions for a Troubled Economic System" (AMACOM, the American Management Association, notes, index, 256 pages, $26.00, available from Amazon.com and other online sellers). With the fall of the Soviet Union and the discrediting of Communism -- even Communist China is essentially a Capitalistic country -- Capitalism is the only game in town, so to speak. Kotler says Capitalism has developed flaws that prevent it from doing its job. He identifies 14 major problems undermining capitalism, including persistent poverty, job creation in the face of automation, high debt burdens, the disproportionate influence of the wealthy on public policy, steep environmental costs, boom-bust economic cycles, etc., and devotes a chapter to each of the 14 flaws. Kotler is a marketing guru, so where does he get off writing about Capitalism? For one thing, marketing may be one of the purest forms of Capitalism -- in my opinion -- and for another Kotler is a classically trained economist -- earning his master's degree in economics (1953) from the University of Chicago, under Milton Friedman; and his Ph.D. degree in economics (1956) from the Massachusetts Institute of Technology (M.I.T.) studying under Paul Samuelson and Robert Solow. Chances are, if you took economics in college, as I did, you used a textbook written by Samuelson. In other words, he studied under three of the most diametrically opposed practitioners of the Dismal Science! And all three are Nobel laureates! Friedman, the icon of the Chicago School of Economics, represents free market economics; Samuelson and Solow are Keynesians. While reading Kotler's very accessible book -- translation, no complicated math -- I came across essays by two diverse critics of Capitalism: Noam Chomsky and Robert Reich. Chomsky deals with the corporatization of higher education: http://readersupportednews.org/opinion2/277-75/29348-the-death-of-americ.... Noting the beyond all reason increase in the cost of college, Chomsky writes that it's free in most developed countries, including Finland, Germany and Mexico. Kotler tries his best to take the "Dismal" out of economics, showing how there are movements toward shared prosperity and a higher purpose than materialistic "getting and spending.". That phrase comes from a sonnet -- quoted on page 217-- by the great English poet William Wordsworth: "The world is too much with us; late and soon; / Getting and spending, we lay waste our powers; / Little we see in Nature that is ours; / We have given our hearts away, a sordid boon!" As an English major, I was impressed with Kotler's choice of poems; It shows that he's much more than an economics trained marketing expert: He grasps the contradictions of Capitalism that need to be addressed. If you want to understand what's really wrong with our present system of Capitalism running amok, you'll have to read Kotler's book. If you don't read anything else about the subject this year, grab hold of this book and be prepared for surprises. Kotler combines economic history, expert insight, business lessons, and recent data in a groundbreaking book that shows we can have a healthier, more sustainable Capitalism—a system that works for all. 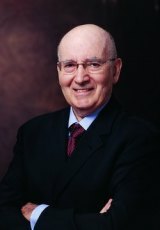 Philip Kotler is the S. C. Johnson Distinguished Professor of International Marketing at the Kellogg School of Management at Northwestern University. He has been honored as one of the world's leading marketing thinkers. He received his M.A. degree in economics (1953) from the University of Chicago and his Ph.D. degree in economics (1956) from the Massachusetts Institute of Technology (M.I.T. ), and has received honorary degrees from twenty-one foreign universities. He is the author of over 57 books and over one hundred and fifty articles. He has been a consultant to IBM, General Electric, Sony, AT&T, Bank of America, Merck, Motorola, Ford, and others. The Financial Times included him in its list of the top 10 business thinkers. They cited his Marketing Management book as one of the 50 best business books of all times. More is available on www.pkotler.org.